Be honest, have you ever heard of Nyungwe Forest in Rwanda? I hadn’t, which in retrospect is rather surprising given it’s the largest high altitude montane forest in East and Central Africa. Even more impressive to me, it’s also home to an incredible 13 species of primate – 25% of primate species found in all of Africa! So it was rather surprising that I had never heard of Nyungwe Forest. Not only that but four species of primate are habituated (used to people). As a result, the park offers guided tours to see chimpanzees, black and white colobus monkeys, Blue monkeys and Mangabeys. During my Rwanda adventure trip, I did guided tours to see the chimps and the colobus monkeys and loved every single minute of both tours – so much so that I’ll be writing in more detail about them in a later post – with some photos of the cutest baby monkey I have ever seen! I watched this 30 year old male chimp for a full hour. Nyungwe Forest is not just for primate lovers though. It’s also an exceptional place for bird watching. It’s home to 275 species of birds and 25 endemic birds, including the Turaco. You will hear its loud call before you see it, making it relatively easy to seek out. It’s a crested bird, who when it spreads its wings reveals beautifully colored red feathers! Click Here to Book Your Ultimate Rwanda Adventure. I would also recommend one of the guided hikes offered. No solo hiking is allowed in the park, and there are scheduled hikes (check with the park office), or book your own in advance. The source of the Congo River is much smaller than I was expecting. There’s also a three day hike which is the furthest source of the Nile. After seeing my disappointment over the wee source of the Congo River, David warned me that while the hike is beautiful, the Nile source was even smaller than the Congo source. Still, I would love to come back and spend more time in the forest. There’s nothing like hearing pant hoots from wild chimps or with a little bit of luck come across a monkey or two! East Africa’s only canopy walk is in Nyungwe Forest. 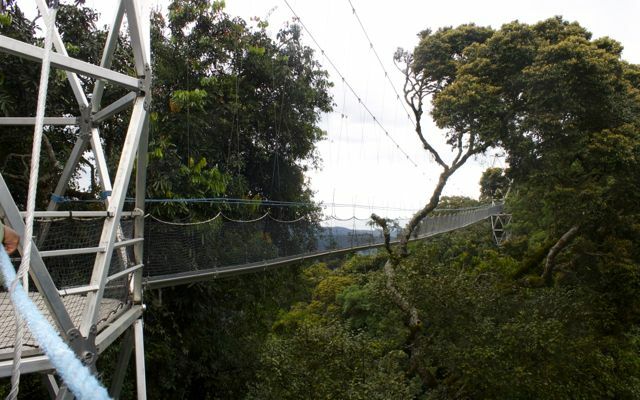 Nyungwe is also home to East Africa’s only canopy walk. If you’re afraid of heights forget it. David said that about half of visitors take the detour after taking one look at the bridge which towers over a valley in the rainforest. This includes the Prime Minister of Rwanda! Of course being a politician, I’m sure he had a good excuse. I spent two days in Nyungwe but wish I could have spent three more. I would have loved to have done the Blue monkey and Mangabey guided treks which are only done in the morning. I also would have liked to have done a full day hike or perhaps even the three day hike to the source of the Congo. The only downside to Nyungwe is that it’s not cheap. Guided hikes start from $40, a trek to see Colobus, Blue monkey or Mangabeys is $70 and a visit to the chimps will set you back $150. Discounts are provided if you do the activities over multiple days. accommodation is also not cheap. There are only three different options. I stayed in the cheapest, which was VERY basic, with a shared bathroom. It cost $70 a night, which was a LOT for what it offered. I didn’t see the other two hotels, but my guide Omar from Amahoro Tours told me that the one hotel had rates starting from $200 a night, while the other was over $300. Still, I felt my money was well spent to see the primates. Nyungwe is one of only a few places in the world where travelers have the incredible opportunity to observe rare primates in their native habitat. In addition, a portion of the money goes back into the local community and community members are given jobs in the park. As a result, poaching is relatively rare in Rwanda, unlike in most other parts of the world. Conservation has a price. Amahoro Tours, a locally owned Rwandan company can arrange your own personalized trip to Nyungwe. Omar, my driver guide was kind enough to even stop when we saw monkeys on the side of the road! Thank you to Amahoro Tours for their support in my visit to Nyungwe Park. As always all opinions expressed are my own. Make 2018 the Year that You See a Mountain Gorilla. Wow. Seems like you have been right in The Heart of Darkness. Doesn't look as scary as the novel though. @TheGypsyNesters - Most definitely! The canopy walk was fun. No, I hadn't heard of it and it has a quarter of Africa's primate species and all those endemic birds. I'm definitely unimpressed by the source of the Congo River. Would have expected something much grander. @Marcia - I hadn't heard of Nyungwe either, which is surprising when you consider all the diversity. Glad I'm not the only one unimpressed by the source of the Congo. Nice option for something off the beaten path! I had to laugh at the source of the Congo. It looks like somebody left a garden hose running. Very humble beginnings for such a mighty river. @Steve - I know right? Definitely didn't meet my rather large expectations. What an amazing experience - I would have watched that chimp for an hour too. Incredible! @Andrea - It was also really interesting to hear all the noises - the scratching and the farting! Looks like you're living the dream in the company of primates. It's such a long trip to just get to these places it really is a shame you didn't have more time. I would love to be birding in here and am in awe of the Turaco. @Leigh - Most definitely and agreed, I wish I would have stayed longer. I'm not an avid birder, but even I was in awe of the Turaco. They're especially beautiful when they fly as underneath their wings is all red. Outstanding photos from your Rwanda adventure. Undoubtedly a life changing experience. I am enjoying this series of posts. Thanks for sharing. @Barry - Thanks so much! More photos to come that are my favorites. This looks right up my alley. It seems my trips lately have revolved around photographing animals. I need to get to Africa! @Christy - Mine too, trips involving animals and nature are almost always my favorite ones. Sounds like an amazing experience! Rwanda hasn't really been on my radar, but this sounds great! @Ali - Rwanda wouldn't have been on my radar either, if it hadn't been for the gorillas, but there's a surprising amount to see in such a small country. What a lovely find! This is exactly the type of place I'd love to visit. Thanks for the gem! @Charu - Highly recommend it. I love discovering places I've never heard about. I can never get good animal shots. Gorgeous!!! I love all of these little guys!! What a great place. Monkeys fascinate me, I think it's the fact that we are so similar. They always look like they know exactly what I'm thinking! @Charli - Funny you said that as I get the exact same feeling, it's like they can see right through you.